We’ve hit it: mid-summer. And with the rising temps and outdoor-centric vacations, it’s nearly impossible to avoid the sun and its potentially dangerous rays. Whether you’ve been bike-riding outside sans sunscreen (guilty) or just had a few too many minutes by the pool, your skin needs a little extra care after sun exposure. While we can advocate getting about 20 minutes of unfiltered sunlight for that natural dose of vitamin D, we’ve got to be careful about what comes next. We’re sure you know that too much sun can lead to irritated, red skin, sun spots and skin damage (remember that photo of the truck driver from a few years back? ), but did you also know that the sun’s impact doesn’t stop when you get yourself indoors? Recent research by Yale University cancer researchers has shown that the damaging effects of ultra-violet rays can continue even after you’ve stopped sun bathing. So, whether or not you’ve gotten a sunburn or your skin is irritated by too many rays, your skin could be feeling the heat. Can we combat this sun exposure? Healthy beauty says yes! Plant-based oils that contain antioxidants and anti-inflammatories may play a significant role in helping skin repair itself and undo sun damage. Skin-cooling and extra-moisturizing ingredients can also relieve pain from burns and help skin calm in the hours after sun exposure. And the best news? You don’t have to seek out an expensive concoction to reap some of the benefits of antioxidants and anti-inflammatories—you can make your own, right in your own kitchen. 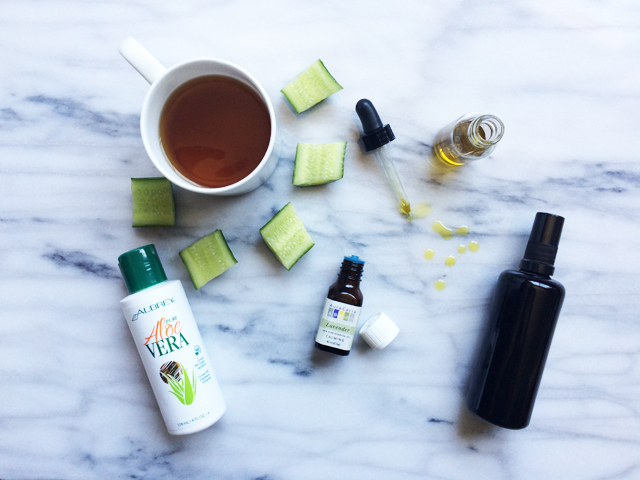 Pour green tea, aloe and cucumber into your spray bottle. Add your argan oil (and lavender) last and give it a good shake to combine the ingredients. Shake well before each use; use before (under sunscreen) or after sun exposure to infuse skin with antioxidants and skin-soothing ingredients. Store in refrigerator and use within a week to ensure freshness.